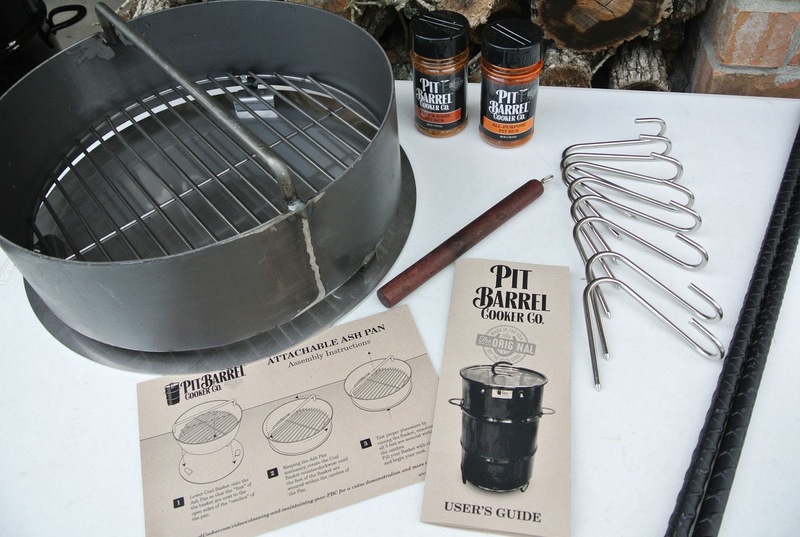 The Pit Barrel Cooker Package is a portable and inexpensive cooker you can use to make perfect food every single time. Being one of the best smokers that the market has to offer, this product is surely one worth considering. 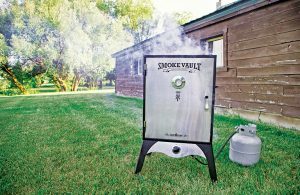 If you are planning to buy it, a detailed Pit Barrel Cooker Package review like this one will help you make the right choice. Pit Barrel stands out from the rest with its simple yet highly effective smoker design. 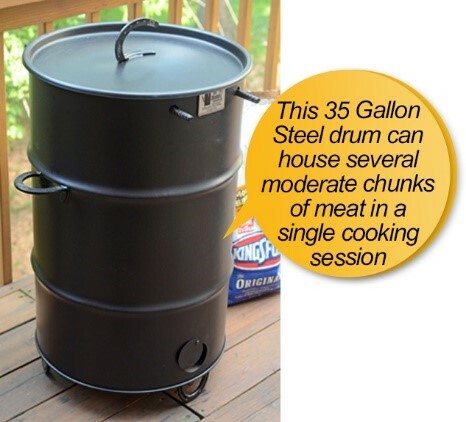 It’s basically a vertical 35 gallon barrel design using sturdy steel. The build quality of this thing is like that of a tank. You can use meat hangers and grill several chunks of meat together, making it suitable for large gatherings of family and friends. It uses particular charcoal that ensures an optimum heat level perfect for the “set it and forget it” experience. 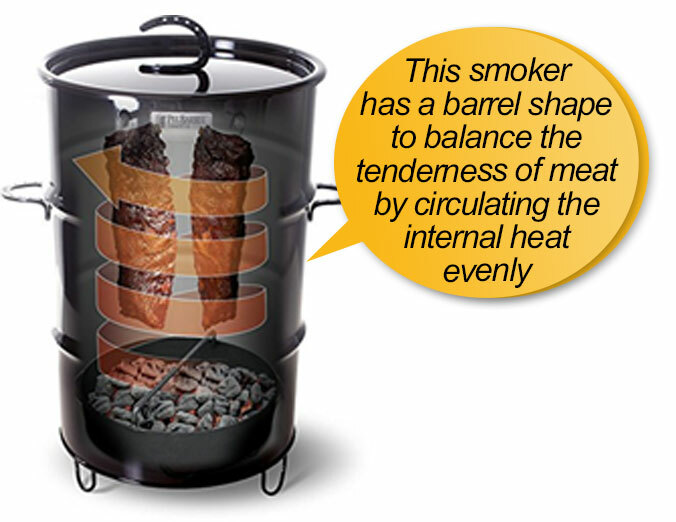 The design of a barrel-shaped smoker has an effect on the taste and quality of the grill. A horizontal shaped barrel smoker might burn your meat in one side and keep the flip side uncooked. This happens a lot. However, Pit Barrel designing engineers understood the problem and came up with this vertical design that allows the heat to circulate in a whirlwind manner while evenly cooking all parts of the meat. Again, the taste it creates is great because it allows the meat to be hung in the center, thus making sure that there is even cooking along with penetration of the smoke/fog that the juices dripping on the coals create. The optimum distance between the heat and the grate helps reduce hot spots and helps in even cooking not just on the bottom, but on the top as well. Different types of meat cannot be grilled using the same settings, and this is where this barrel cooker becomes a winner. The package comes along with a steel grill gate, which not only helps it to function as a grill, but also makes use of its added temperature control and depth. This can be used to sear a steak as well as cook at higher temperatures by removing the lid. You can even leave the lid on to add extra depth to the fish, pizza or the cookies you are trying to make. The grilling grate is added for grilling meats that you cannot hang with the meat hangers. You can also cook Pizza and smoke vegetables using this part. It is placed in the middle of the cooker below the meat hangers. 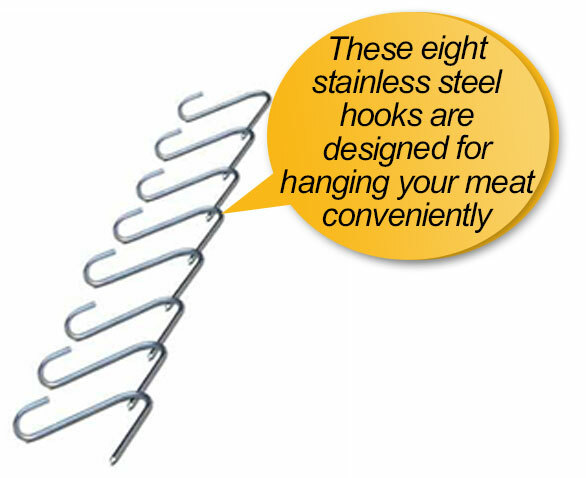 The smoker has 8 stainless steel hooks that positioned on the two steel rods for hanging meats. These are superbly strong and will last a lifetime if used with care. You will also get a pulling stick to place and remove these hooks during cooking. You can also use heat gloves that come with the unit for extra protection. The rods are positioned at a very convenient distance so that you do not have to worry about removing the grilled meats. The charcoal basket of the cooker is nicely built. It has just the right amount of space to store enough amount of charcoal for a long cooking session. It has a netted base that allows enough airflow to ensure the fire gets the right amount of oxygen. Air vent is designed for providing ventilation inside the smoker. It is vital for the coals to burn. Keep the air vent 1/4th way open for sea level up to 2000 feet. Keep it halfway open if you are living in between 2000 ft. up to 5000 ft. Leave it 3/4th way open in between 5000 to 8000 ft.
Another interesting feature of this smoker is the barrel stand that keeps the smoker elevated from the ground. As a result, you do not have to worry about air ventilation as well as damp ground that might affect the cooker. This unit comes with 4 7-ounces All-Purpose Pit Rub and 4 77-ounces Beef & Game Pit Rub. 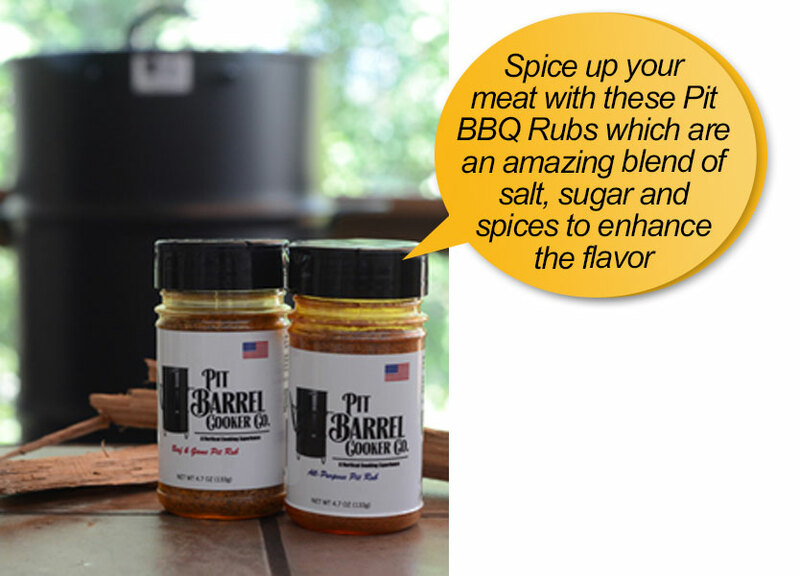 Use the pit rubs on your BBQ meat to enhance the taste. It is basically a made of a combination of salt, sugar and other spices. It gives the grilled food amazing flavor. 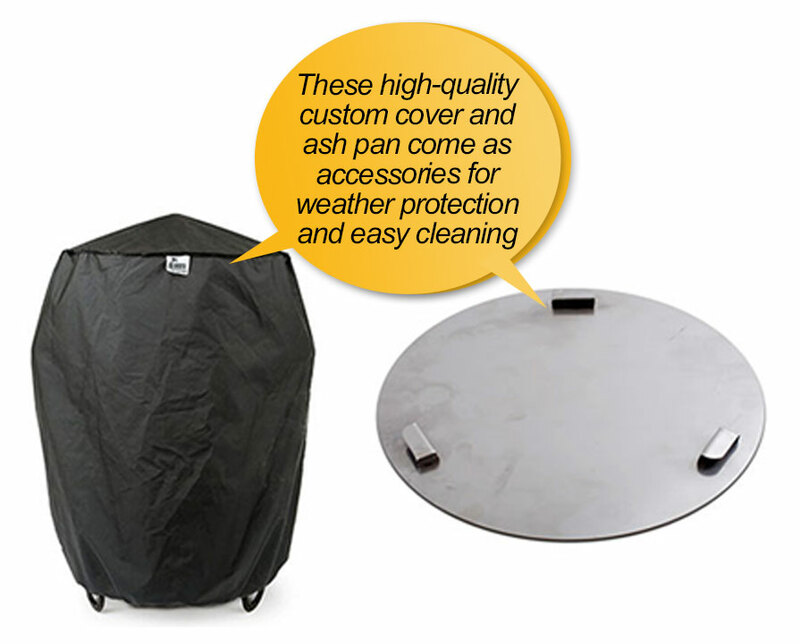 You will find a high-quality custom smoker cover with the package. It is made to protect the smoker from rain, dust and direct sunlight when it is not in use. You must keep the smoker covered when it is not used if you want it to look new even after years of use. There is an ash pan on which you will set the smoker. This will catch all the pit ash and you can later easily clean it without ruining your patio or yard. 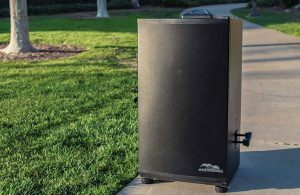 Unlike other smoker barrels and BBQs, the Pit Barrel Cooker is quite light and compact, making it easy to transport in a truck, van and even SUV. 1. It is essential that before following any steps of ash removal, you let the ash cool down completely and dispose it of properly. a. Ashes can be dumped with any heat-resistant container by just lifting and throwing them away. b. Use a dustpan to scoop out the ashes. c. The bottom of the PBC can be lined with a tinfoil sheet before the coal basket is set. Once you have used the PBC and it is cooled down, the ashes can be simply lifted and removed. d. Attachable Ash Pan (sold separately) can be used to catch ashes so that they can be easily removed. 2. After some time of usage, there will be some buildup of ashes inside the barrel, which is a ‘Seasoned Drum’ but not a peeling paint. This is not harmful at all. In fact, it is quite normal. 3. To wipe the PBC when it is hot, use a damp rag for easy removal of smudges and dirt. One of the most distinctive features that sets this cooker apart from the rest is that you do not need to read any manuals or instructions for setting up the Pit Barrel Cooker Package! It is delivered to you ready-to-go, without requiring any assembly. Most grills and smokers need a water pan that has to be filled constantly in order to avoid lack of humidity issues. However, that is not true for the PBC and when it is loaded, moisture collects itself inside the barrel. So there is no need of any water pans and constant refills. In traditional grills, food is cooked only from a single and direct source of heat. 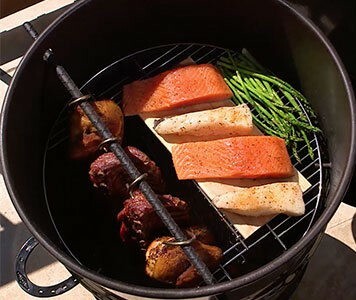 However, the Pit Barrel Cooker, along with its cylindrical shape together with the ‘Hook and Hang’’ method, puts the food at the center, heating it evenly from all sides simultaneously. Thus, you get perfectly cooked and great tasting meat every time. 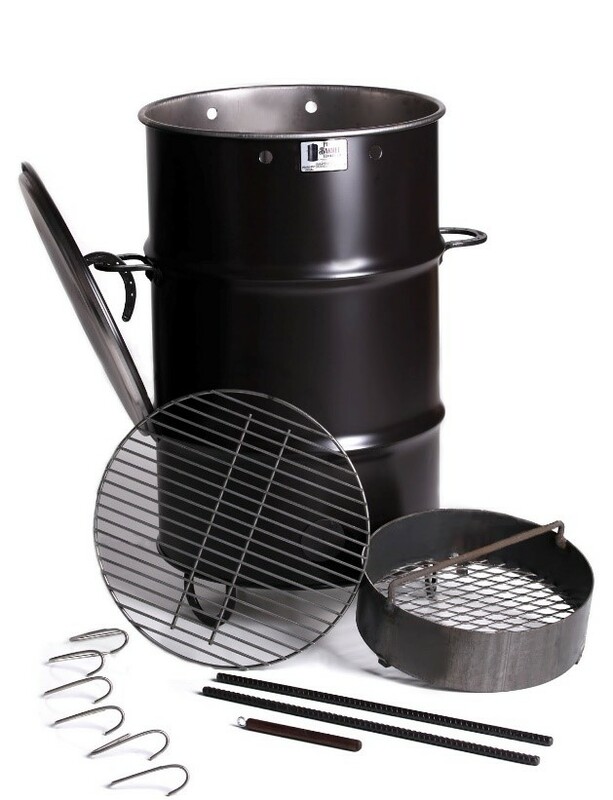 Despite of its affordable cost, this cooker package can be used for a range of cooking styles and dishes, as mentioned earlier in this Pit Barrel Cooker Package review. It can be used to make hamburgers, chicken, pork loin and a lot more. What makes this even easier is that you do not need to constantly adjust the vents and the temperature. Just hang it, and then let the PBC do the rest! With dimensions of 22x22x33 inches, the Pit Barrel Cooker has a high capacity and can be used to make up to 8 slabs of ribs at one time! All you need to do to cook food faster is read the instructions that are given with the package. Then you will be able to grill different types of meat and ribs faster and better than any other grill or smoker. 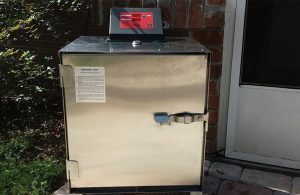 If you are the kind of person who likes to control the temperature with as much precision as possible at all times, then this smoker/cooker is going to be a problem. The temperature is too high at first, then it sinks down and then rises back up again. The damper, which is not supposed to be changed at all as per the instructions, can be used to control it but with great difficulty. Even after reading all the instructions, placing and hanging meat in the Pit Barrel Cooker Package could be a bit of a hassle. The rods need to be set in parallel when the cooking grill is being used, else the correct air flow will not be maintained. In such situations, the grill’s surface stays too low to allow the use of a spatula and the grill bar acts as a hindrance as well. It comes with a solid construction which reduces the amount of maintenance required. All it takes is some regular cleaning and you can easily use this cooker/grill as many times as you want everyday! In case any customer is not 100% satisfied with the package, the purchase price will be refunded within 30 days. Apart from that, there is a 1-year warranty on the product for all manufacturing defects. This warranty is only valid when the Pit Barrel Cooker Package is purchased from the manufacturer’s website or a participating retailer, so check the retailer carefully before you buy one to get the warranty. 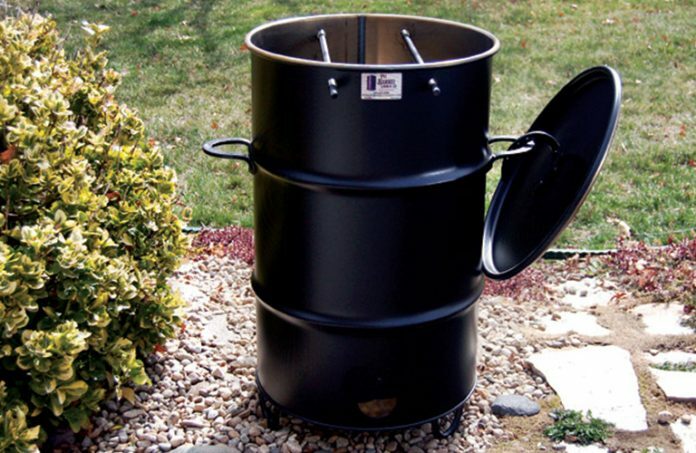 With a standard price tag, the Pit Barrel Cooker Package is a sure value for money product. A wide range of features and accessories, 1-year warranty, and easy cleaning and maintenance make it far better than most grills and cookers available in the market. 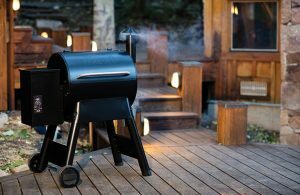 On average, similar products cost above one thousand dollars, and the Pit Barrel Cooker Package is definitely reasonable at less than one-third of that price! All major replacement parts as well as accessories are directly available from its manufacturer’s website. Users should only purchase these from there or an authorized retailer to get all warranties and guarantees along with genuine spare parts when replacing the parts are needed. Thus, it is quite safe to conclude that the Pit Barrel Cooker Package is a product worth more than its price. With its wide range of applications, durability and versatility, this barrel cooker is a must for those who love well-cooked meat and ribs, and are looking for an affordable yet extremely high-quality and functional cooker. The PBC is a great product not just for advanced users, but also for those who are new to the world of BBQ and grilling. So everything you have read so far should be enough to get you started on the path of making the right purchase for getting the most deliciously cooked meat and ribs! Q: Is it a slow smoker or cooker? 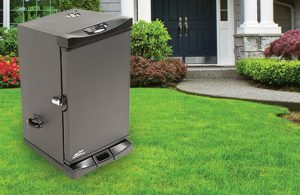 A: The Pit Barrel Cooker is a perfect combination of a smoker and a BBQ. Considering the meat-hanging method, this is a category of its own in the cooking environment it provides. Q: Is it required to use a lighter fluid with the PBC? A: While a lighter fluid is recommended, a chimney can also be used. To do that, fill the coal basket using Kingsford Original Briquets, take out a fourth of them and put them in a chimney. Light the chimney and wait for around 20 minutes, pouring the lit coals on top of the rest coal basket. Then hang your meat and let the cooker do the rest. Q: Is it required to add any additional charcoal or coals in it? A: No, this will not be required. Depending on the elevation, the PBC will burn quite efficiently for at least 7 to 8 hours. Q: Does everything have to be hung on it? A: If the meat is for hanging, then hang it. For other things, like pizza or burgers, the grill grate can be used for grilling them. Q: Will the handles on its top and the outside get hot? A: Just like other grills and BBQ, the Pit Barrel Cooker will be hot outside, so avoid touching it. The lid handle will not get hot though and can be touched while in use. I enjoy you because of all your valuable hard work on this blog. Kate really loves going through research and it’s really easy to understand why. We all know all about the powerful method you create rewarding things on the website and therefore recommend contribution from some others about this issue and our own simple princess has always been becoming educated a lot of things. Take advantage of the rest of the year. Your conducting a remarkable job. One overwhelming admiration indeed! Lots of love dude! Spot on with this write-up, I actually suppose this website needs far more consideration. I will probably be again to learn rather more, thanks for that info. What type of consideration are you actually talking about Sir? We also love your cheerful participation. Happy reading! !